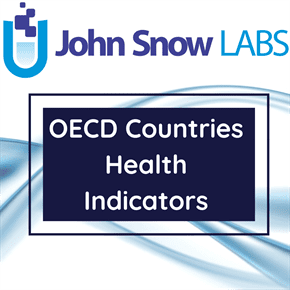 This dataset contains internationally comparable indicators regarding patients mortality and survival for country members and partners of OECD (The Organization for Economic Co-operation and Development) and for countries in accession negotiations with OECD. The indicators values cover the period 2000-2015. Breast cancer 5-year net survival is measured by dividing the number of women aged 15-99 diagnosed with breast cancer (first primary cancer at the specified site) divided by the expected survival of a comparable group from the general population. Cervical cancer 5-year net survival is measured by women aged 15-99 diagnosed with cervical cancer (first primary cancer at the specified site) divided by the expected survival of a comparable group from the general population. Colorectal cancer 5-year net survival is measured by dividing the number of men and women aged 15-99 diagnosed with colorectal cancer (first primary cancer at the specified site) divided by the expected survival of a comparable group from the general population. Data is provided separately for colon and rectal categories of cancers. Leukaemia is the most common childhood cancer and accounts for over 30% of all cancers diagnosed in children aged below 15 years old in the world (IARC, 2012). Children with acute leukaemia who are free of the disease for 5 years are considered to have been cured as remission after 5 years is rare. For the AMI and stroke indicators, two types of case-fatality indicators are collected. The first reports on the percentage of deaths that occur within 30 days following admission (admission-based), where the death occurred in the same hospital as the initial admission. The second indicator reports on the percentage of deaths that occur within 30 days following admission (patient-based), where the death may have occurred in any hospital or out of hospital. While the second indicator is preferred, not all countries have the capacity to report these data. The admission-based AMI and stroke indicators are measured by dividing the number of deaths in the same hospital that occurred within 30 days of eligible hospital admission (as defined by the ICD-10 codes and age 45 years and older) by the number of admissions to hospital with primary diagnosis defined by the ICD-10 codes specified and age of 45 years and older, where the admission did not result in a transfer to another acute care hospital, from 1st of January to 31st of December in the specified year. The patient-based AMI and stroke indicators are measured by dividing the number of deaths in any hospital and out of hospital that occurred within 30 days of eligible hospital admission (as defined by the ICD-10 codes and age 45 years and older) by the number of admissions to hospital with primary diagnosis eligible defined by the ICD-10 codes specified and age of 45 years and older, from 1st of January to 31st December in the specified year. The HCQI project has monitored national information system infrastructures with a view to refine definitions of these indicators and to improve cross-national comparability. In-patient suicides among people diagnosed with a mental disorder is measured for patients aged 15 and older by dividing the number of patient discharges among denominator cases coded as suicide in the reference year by the number of patients discharged with a principal diagnosis or first two listed secondary diagnosis code of mental health and behavioral disorders in the reference year. Suicide within 1 year after discharge among patients diagnosed with a mental disorder is measured for patients aged 15 and older by dividing the number of patients among denominator cases that committed suicide within 1 year after discharge by the number of patients discharged alive with a principal diagnosis or first two listed secondary diagnosis code of mental health and behavioral disorders in the reference year. In cases with several admissions during the reference year, the follow up period starts from the last discharge (discharge from a hospital and thus not from one department to another). This indicator required data that links hospital records with deaths after discharge. Suicide within 30 days after discharge among patients diagnosed with a mental disorder is measured for patients aged 15 and older by dividing the number of patients among denominator cases that committed suicide within 30 days after discharge by the number of patients discharged alive with a principal diagnosis or first two listed secondary diagnosis code of mental health and behavioral disorders in the reference year. In cases with several admissions during the reference year, the follow up period starts from the last discharge (discharge from a hospital and thus not from one department to another). Only the countries with a pre-existing registry which records the whole population of severe mental illnesses needed to report this indicator. Breaks in the time-related continuity of data on which the indicators values are based are specified in the content of dataset. There are also specified the cases were the methodology used for data collection was different (deviations exist).